Cynthia Hutchings’ Honors English I class at Smithfield-Selma High School won the nationwide Achieve3000 literary competition. The competition helps enhance students' literary proficiency to levels required by colleges and careers. 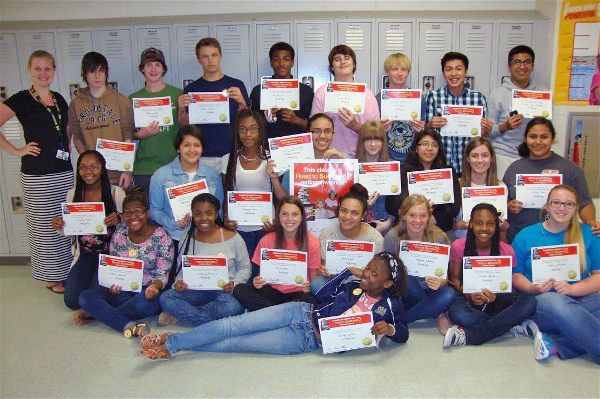 To win, each student was required to read a minimum of eight nonfiction Achieve3000 articles during a twenty-eight day period and correctly answer questions built around Common Core proficiency standards. The class won the competition with more than 30,000 points. They were awarded a $30 gift card for a pizza party, which they enjoyed. 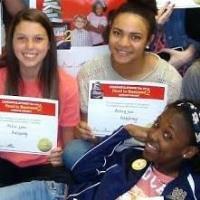 PHOTO BELOW: A group of Smithfield-Selma High School students won the nationwide Achieve3000 literary competition. On the front row is Jamya Collins. On the second row (from left) are Makayla Mitchell, Tatyana Mcelveen, Mollie Lane, Ashley Lee, Meghan O'brien, Sabrea Johnson, and Nadia Whitaker. On the third row are Payton Parker, Gabriela Aguilar, Jasmyne Davis, Genesis Doblado, Isabel Douglas, Debbie Herrera, Shannon Parrish, and Evelyn Tovar. On the back row are Ms. Cynthia Hutchings, Michael Menjivar, Colby Langley, Henry Moore, Elijah Hill, Dylan Dacey, Cole Davis, Fernando Perez, and Carlos Ruiz- Hernandez. Not Pictured are Patrick Herrmann, Mikayla Rabil, Titus Sanders, and Tremaine White.